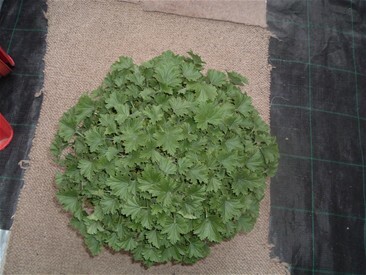 I always double pot all my Pelargonium plants in the greenhouses, I find that it halves my watering. 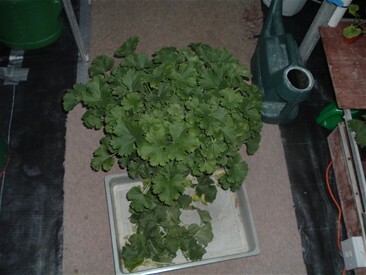 Plants do not dry out so quickly especially in the summer, and also helps to keep the roots warmer in the winter. 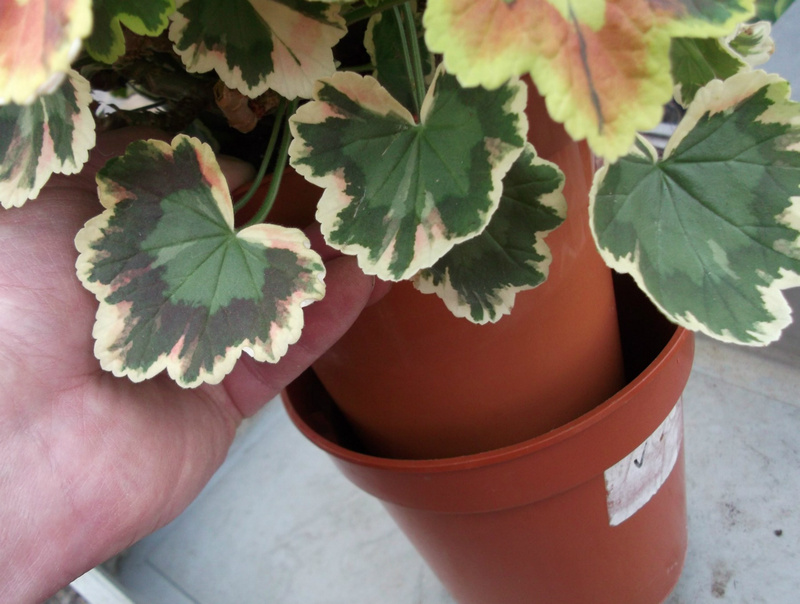 Placing a plant inside another pot of the same size. 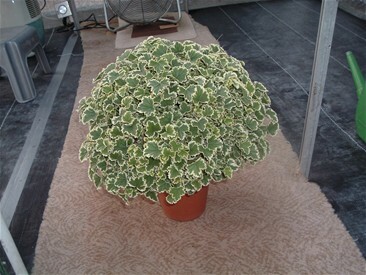 Below you will see a Unique called Polka. I removed some of the bigger leaves to let in more light to the leaf axils. This helps the new growth coming through, makes them stronger and new leaves will soon help the plant to make a nice shape. 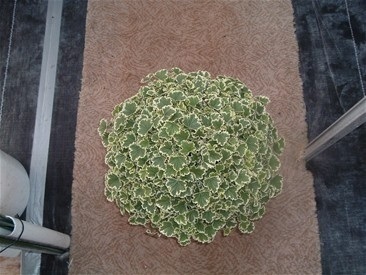 It also helps air to circulate through the plant in winter, my Regals get the same treatment. Something I get asked a lot is how long do I show a plant for. Well that depends on what type of plant it is. On average it is between 3 & 4 years, after which they are used in the garden or dumped. 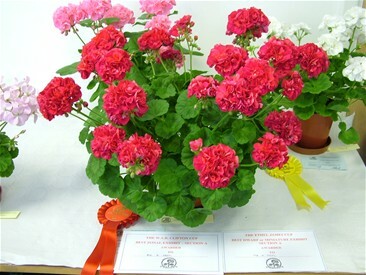 The Oldbury Duet in the photo was 3 years old when it won the Best in Show at BEGS 2008, I cut it back and as you can see it has come back really well. Fingers crossed it's looking good enough to be back on the show bench in 2009, when it will be 4 years old, (it was grown from a spring cutting). I grow Angels and Regals on a 2 year cycle so I take the cuttings in the spring, and they are not allowed to flower until the 2nd year. I have found over the years that a plant grown this way, will be larger and therefore produce more flowers. 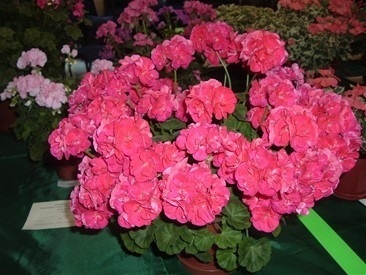 The plant of Quantock Kirsty below shows the sort of plant I aim for. It is in a 5" pot and stopped to get a round shape. I have used the 2 photos of Bold Carmine, to try to show why I prefer to grow on a 2 year cycle. 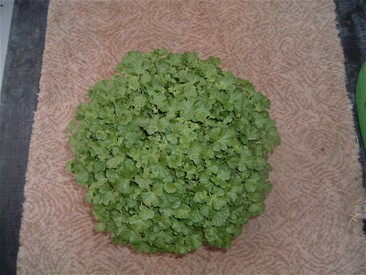 As you can see a 2 year old plant, can have up to twice the amount of bloom.